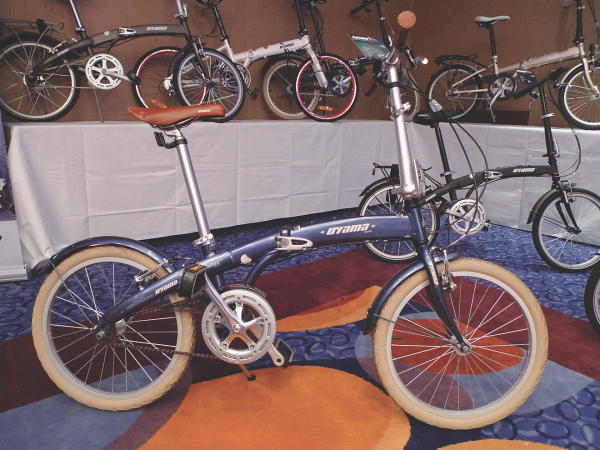 The Taiwanese company Oyama has been making folding bikes since 1966 but so far they hadn’t been shipped to the UK. That’s all changing now. While we were at the recent Moore Large trade show we couldn’t help but notice this enticing range of folding bikes by a firm called Oyama. The Taiwanese company, which has been making folders since 1966, now produces 11 small-packaged wonders, but two models in particular caught our eye. The first was the quick-looking Crosstown, finished in ice white and featuring familiar touches like a racing-style saddle and, unbelievably, a full Shimano Tiagra 18-speed drivetrain. The frame is made from lightweight aluminium, with the whole bike tipping the scales at a reasonable 11kg. The price for this city-centre speedster is £899.95. Meanwhile, for those wanting more refinement, but less speed, there’s the Manhattan model shown above. Selling for £429.95, the Manhattan comes only as a singlespeed, but you get a natty Brooks-style riveted saddle and leather bar grips — not to mention those retro white-wall tyres. The weight is slightly more hefty at 12kg.